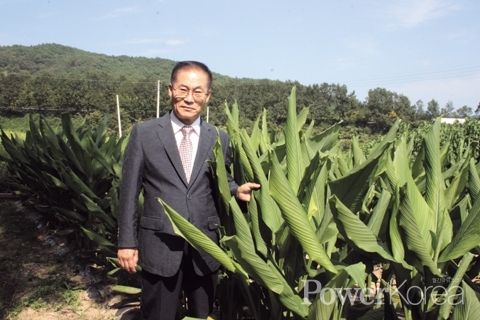 Sancheong County is famous for growing medicinal herbs. Over 1,000 kinds of medicinal herbs are known to be growing in and around the county which covers Jirisan Mountain to the west. Naturally, a variety of health functional food are produced and sold. Sancheong Jirisan Medicinal Herb Agricultural Association Corporation was established to make the most of these abundant natural resources into health functional foods from tumeric and gastrodia to raisin and snail extracts and sweet wormwood. "All products of the corporation are made with 100% local ingredients under strict health and hygiene rules. So you can be 100% sure of its safety. Our famous Ojuk Snail Extract is used for making skin care and tonic products. Snail has rich chondroitin that is good for arthritis and bones. We use Ojuk (bamboo) produced at Ojookwon and it is known to ease inflammation" says the cooperative president Gwon Young-sik. 'Fermented Sweet Wormwood Extract Gold also is one of the hit products of the corporation. Sweet wormwood is known to be used for a long time to improve symptoms of diabetes, asthma and dysentery. Also, curcumin in tumeric is known to be good for anti-cancer, diabetes, high blood pressure, skin disease and detoxing. The fermentation and ripening technique of the corporation is well known for doing the process for more than 10 hours to extract; it keeps the nutrients intact without destroying. "We use boiling extract method with appropriate amount of medicinal herbs. Using the right amount of ingredients is as important as the right length of time for fermentation and ripening. This way, we can maximize the effect of health functional food." All these processes are done with the support of cutting edge devices and the corporation also simplified the distribution system to provide the products at rational prices. You can order the products at its homepage.